No way these bikers were letting Marine’s ashes get shipped home in Fed Ex box! When a group of patriotic bikers learned that a Marine’s ashes were to be shipped home because his mother couldn’t afford a trip to his funeral, they stepped into action. Staff Sgt. Jonathan Turner died in August in California from combat-related injuries after serving seven tours of duty in Iraq and Afghanistan, KOTV reported. His mother could not afford the trip from her home in Georgia to California for funeral services held by the Marine Corps, and Turner’s ashes were to be shipped home in the mail. But when Oklahoma’s Patriot Guard Riders found out about it, they made plans to carry the ashes home. “We did this primarily because his mother was unable to attend the services, and he had been cremated and we didn’t want him to go home in a FedEx box,” Capt. 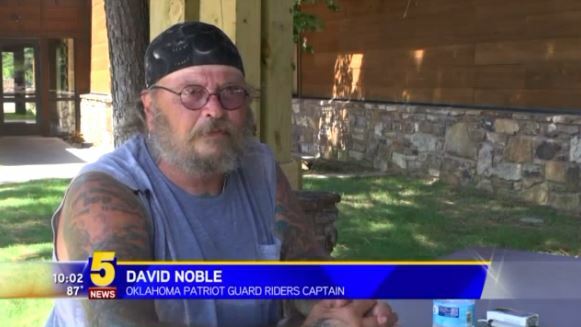 David Noble of the Riders told KOTV on Aug. 9. They even had a service for Turner at a rest stop on Interstate 40 as one group of riders handed the remains off to another group. “Turner was a great leader who inspired his fellow Marines, both in the corps and in daily life. You were his friend if you knew him for five minutes or five years. He would give you the shirt off his back,” the Riders wrote on their website.